The Scoop on Protein Powder: Processed Junk or Useful Life Hack? Some people swear by the stuff. Others can’t stand the thought of choking down a gritty, highly processed powder and calling it a ‘meal’. 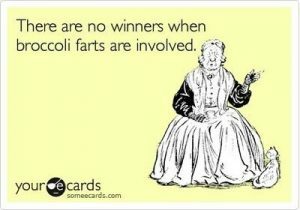 As one who is a staunch proponent of food first, I completely understand those who take the latter position. The reality is all protein powders are highly processed. Whether it is whey from a cow or sprouted hemp seeds, what you buy in the jar no longer resembles its original form. It has been radically altered to be shelf stable, dissolvable in water, and somewhat palatable to boot. That does not make it inherently bad though. 1) I don’t have time for breakfast. Skipping breakfast, or grabbing a coffee instead, can exacerbate hunger and cravings later in the day and perpetuate a cycle of overeating or excessively snacking at night. This is bad for cholesterol, inflammation, and weight. A protein-rich breakfast in the morning will often completely decimate food cravings for the rest of the day. Since few people have the time to make a frittata or whip up some turkey sausage and eggs in the morning, a smoothie made with protein powder can get slow-burning, appetite stabilizing nutrition in first thing in the morning. And that is a net win, my friends. 2) The narrow window athletes have for optimal refueling. After a workout our cells are primed to receive nourishment. The sooner we feed them the greater the impact on post-workout strength, recovery, and energy. 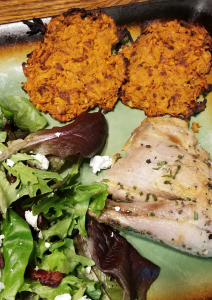 My clients who run marathons and refuel immediately with at least 20 grams of protein coupled with quality carbohydrates feel a huge impact on the following 48 hours post-race. Often times this means bringing protein powder along with you to consume after crossing the finish line. Post-race snacks provided are so focused on carbohydrates that the key component of protein is often left out. Men have a 45-60 minute window to refuel and women only have 30 minutes to get the most bang for their buck. Therefore protein powder is my top choice as an athletic recovery food on race day. This is another time of day when it is very easy to get up from one’s desk and grab a quick sugar-laden snack or coffee drink to power through the rest of the work day. Protein and some fruit is often a better choice, but requires more planning and prep than running across the street to Starbucks. Using protein powder instead for a quick shake does a much better job at restoring energy and clarity to finish the work day strong and saves time to boot. So let’s say you decide that having protein powder around is a useful thing for you. Not all proteins are of equal quality and not all proteins provide the same benefit. A) Protein powders have wildly varying quality of ingredients. You can head to the local supplement shop and pick up WEIGHT GAINERZ 2000 in a tub the size of your torso and take home a hodgepodge of cheap milk proteins, artificial flavors and sweeteners. You can also find organic, grass-fed whey from New Zealand goats who grazed on pristine pasture for the duration of their lives and are never separated from their offspring for the sake of milking. Quality varies wildly, so educate yourself and be a savvy consumer who inspects the label rather than falling prey to marketing tactics. B) What’s the Best Protein Source for My Needs? If you are looking to gain muscle or body weight you’d do best with a high quality whey protein containing at least 2 grams of leucine per serving after a hard workout and a casein protein to take in the evening. Whey is absorbed pretty rapidly and is perfect for refueling while casein provides a slow burning protein source that can be used to fuel growing muscles while you sleep. If you do not consume dairy products my best advice is to try single serving packets of various proteins from egg or vegan sources until you find one that works for both your tastebuds and your digestive system. This can take a while. Of note – leucine is an amino acid especially high in undiluted whey protein that stimulates muscle growth and recovery. If you are a vegan or you are dairy-sensitive and looking to build muscle your best bet is to supplement with branched chain amino acids containing at least 2 grams of leucine after your workout and using your protein of choice as well for refueling or energy stabilization. Some vegan proteins, like VegaSport, add branched-chain amino acids to their protein for athlete’s needs. Just check the label for the leucine amount to ensure it is adequate. A third option is what is called ‘Medical Food’. These are protein powders with specific supplements added to them to essentially provide a drinkable supplement. Offered by high-quality supplement companies like Thorne and Metagenics, their medical foods are designed to help stabilize blood sugar, assist in the body’s detoxification pathways, lose weight, or curb systemic inflammation (depending on which you are prescribed). They are typically only available from healthcare providers and are an excellent alternative to taking handfuls of pills each day for a specific medical condition or health goal. What’s your take on protein powder? For those of you who consume it regularly – do you have a favorite brand? This peanut lime vinaigrette is an adaptation from a recipe recommended to me by a member of the VIBRANCE Village of Health on Facebook. The lime lightens up the sauce a lot and, unlike a traditional peanut sauce, this one does not feel heavy and comforting for winter, but rather light and refreshing and best enjoyed on hot summer evenings or days when you are pining for hot summer evenings. Having discovered it in dreary, grey January, it’s been a culinary reminder of days to come. 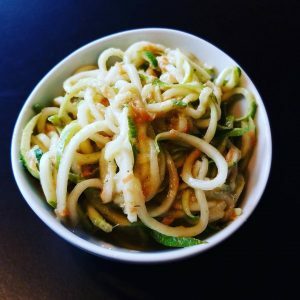 If you’ve not spiralized I highly recommend it! 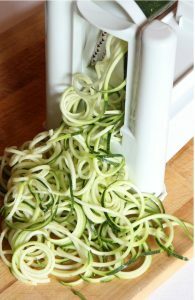 It’s a fun way to get extra veggies in (think carrots, zucchinis, yams, and more) and kids enjoy being part of the spiralizing process, which then has them more invested in eating the outcome. I have a Paderno I picked up 5 years ago that is still going strong but would now totally choose this Spiralizer on Amazon because it comes with extra blades and recipe ebooks. If you’re like 87% of Americans and struggling to get enough veggies in, our totally free challenge, 30 Days of Glorious Greens is the perfect challenge for you. Offered only once year in March, this program dives into best practices to get greens in, delicious recipes, and fascinating science behind the glory that that is the humble green. You can sign up below the recipe! 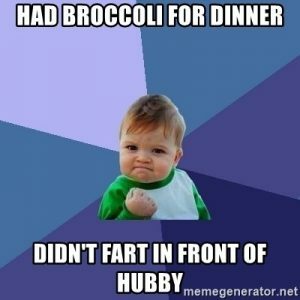 Makes 1 cup of sauce and 4-6 servings of zoodles. Add chopped nuts, sprouts and extra cilantro on top before digging in. In a blender, puree all sauce ingredients except the oil. While the blender is running, add oil in a thin stream until dressing is emulsified. Mix zucchini with carrots and scallions. Add the dressing and toss well to mix thoroughly. Best enjoyed within 24 hours, but will last 2-3 days (note that over time the zucchini will lose moisture and become more dense, but still delicious). Recipes like this, and much more, are part of the 30 Days of Glorious Greens Challenge. Sign up now to reserve your seat and receive my best, most delicious tips and practices to keep vegetable intake high. Registration is open now and we begin March 4th!